The refurbished Dell M1000E from Bargain Hardware is a highly customisable 10U blade chassis for the Dell PowerEdge M blade server range. When optimised to its full potential it is perfect for high demanding applications, web hosting and virtualisation. The advanced design offers one of the highest industry performances in terms of performance per watt, thanks to its excellent power and cooling efficiency. The M1000E has 16 front-plane slots which can hold quarter, half or full height blades giving a maximum of 32 quarter height blades. 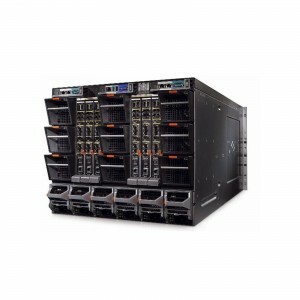 The back-plane takes up to 6 x I/O interconnect bays and is capable of holding up to two Dell CMC management modules. The back-plane also accommodates up to 6 redundant PSUs and up to 9 redundant cooling fan modules. The Dell M1000E provides best in class CMC Chassis Management Facilities, either remote via iDRAC or local via KVM. There is also a small LCD screen that displays essential information. With so many configuration options available for the M1000E, Bargain Hardware’s Configure to Order system really comes into its own. As we receive shipments from corporate clients in the process of upgrading their data centres and server farms, each component is refurbished, checked and tested before entering into our state of the art CTO system, which enables you to re-specify an entire system to your exact requirements at a fraction of the original price. In addition, you can contact our sales staff directly for one to one technical sales advice.